There are still big questions that need to be answered in cosmology. Modeling one universe can be a challenge in itself. But now, a PhD student has managed to create thousands of universes simultaneously using the grid to find answers. Read about how an intelligent computer model utilized the UK's National Grid Service. There are currently two unsolved major issues in cosmology, and a PhD student hopes to help solve them by creating a computer model of almost 2,000 mock universes, using the grid. Simulated distribution of dark matter haloes. Image courtesy Max Planck Institute. Cristiano Sabiu is a recent Science and Technology Facilities Council (STFC) PhD graduate from the University of Portsmouth, UK, where he studied the distribution of galaxies under the supervision of Robert Nichol. The distribution of galaxies can tell us a great deal about the underlying physics which govern the dynamics and evolution of our own universe. Now, Cristiano has used the UK's National Grid Service (NGS), to help model not just our universe, but the 'multi-verse' too. His goal is to help explain two mysteries of cosmology. It is known from recent observations that the universe is not only expanding, but is doing so at an accelerated rate. What is driving this? Some theorize that this unknown force is dark energy. The second mystery is that observations tell us that an extra source of gravity must exist in the universe. Some researchers think this could be because there are particles which do not emit light and only interact through the gravitational force; such particles are called dark matter. Cristiano used an alternative to this standard bias. Known as Halo Occupation Distribution or HOD, this alternative method places galaxies within a Dark Matter distribution or 'halo.' Although HOD has advantages over the bias method, its exact form is not well understood. His research focused on finding the exact form of HOD: mathematically, this involves solving unknown variables in an equation; in practice, he explored how the galaxies we see are connected to invisible dark matter. This required running many large scale N-body simulations of dark matter -- recreations of dynamic systems of particles, usually under the influence of physical forces such as gravity. From these simulations he created a multi-verse of almost 2,000 mock universes which used multiple HOD models. These were then compared to the actual galaxy distribution as observed by the Sloan Digital Sky Survey (SDSS), thus establishing realistic constraints on the model's parameters. These simulations were run using the publicly available GADGET2 code. GADGET2 is an N-body integration routine which can run cosmological simulations on massively parallel computers with distributed memory. It uses an open communication model and can be run on all current high-performance computer systems, including clusters of workstations and individual PCs. The UK's National Grid Service has been providing grid computing resources for scientific applications since 2004. 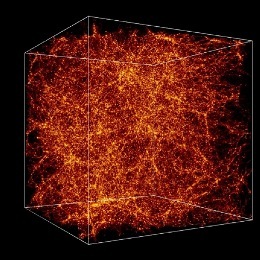 Cristiano simulated cosmological large-scale structures using over 100 million dark matter particles. His models were uniform and very spatially homogeneous, which meant all the particles were distributed evenly throughout his virtual universes. The GADGET2 code was able to handle the scalability issues that came with these scenarios. He completed a series of cosmological simulations, using a 128 CPU configuration on the NGS-RAL scientific computing facility in the UK. In the end, Cristiano successfully ran 20 full-scale simulations, requiring 100,000 CPU hours over a 12-month time period. Cristiano said "GADGET2 was installed for me on the NGS and was optimized for their system. It is now available to all NGS users, so if you fancy creating your very own universe why not give it a go." He concluded that, "Without the NGS my PhD project could have taken 10 years." The original story was published on the NGS website. Please view it here.